Fall is creeping up on us very quickly. The flowers and blooming plants seem to be rejuvenated and full of color for one last fling before winter. This is, however, the time of year when many of us experience our yearly battle with hay fever. It is hard to appreciate the beauty of fall leaves and mums when you are looking at them through itchy, watery eyes with a tissue in your hand, awaiting the next sneeze so you can dab at your already irritated nose. Yes, for those of us who suffer with hay fever, fall is prime time for another bout and we do not tend to look kindly on blooming plants. We all know that pollen causes the problem, but what kind of pollen? As we drive down the road we tend to shake our fists at the bright displays of golden rod that grow in abundance. But, the poor, misunderstood golden rod is not the problem. Its’ pollen is too heavy to be carried by wind. 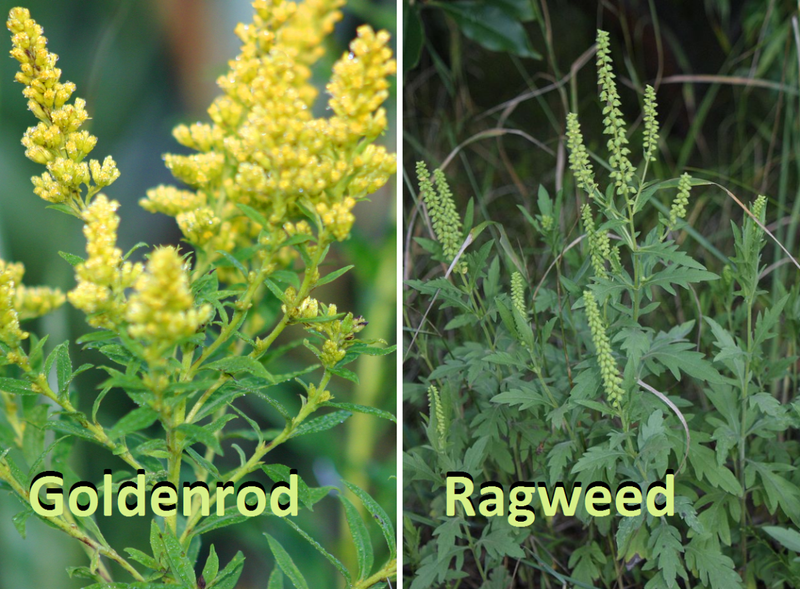 The real problem is ragweed, whose pollen is most responsible for late summer and fall hay fever in North America. It is much easier to blame large, bright colored flowers, but in reality the pollen from most of these blooms is large and heavy just like golden rod pollen. Low growing weeds, grasses and many trees have small, light, dry pollens that are much better suited for dispersal by the wind. These are the pollens that get us! There are some things we can do to keep symptoms at a minimum: Don’t hang laundry outside to dry because pollen collects on fabric. Keep bedroom windows closed at night. Hire someone to do the lawn work during the early part of fall and avoid pollens by staying inside during peak pollen hours-early morning and late afternoon and also on windy days. Most of us who are regular recipients have learned how to cope. Now, go out and apologize to the nearest golden rod!